A popular Noodle variety in Singapore and Hong Kong, this stir-fried noodles is easy and quick to make. 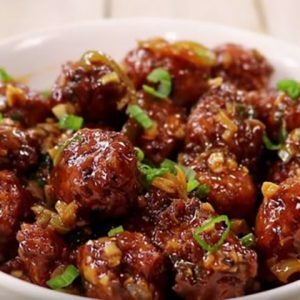 There are numerous variations to this dish, including a vegetarian version, with different varieties of noodles or with pork instead of chicken. 1. Soak the rice vermicelli in warm water for 10 to 20 minutes or until soft. 3. Pour the corn flour mixture over the chicken pieces and mix well until coated. 5. Heat 3 tsp oil in a pan over medium flame. 6. Saute the onions, capsicums and garlic for a minute. 7. Add the shrimps and chicken pieces. 8. Cook until they start to change colour. 9. Add the vermicelli and stir-fry for a minute. 10. In a nonstick pan, add 1 tsp oil and add the egg. 11. Cook until the bottom sets and transfer to the noodles. 12. Add the sauce and stir well. 13. Cook for another minute or two, stirring from time to time. 14. Garnish with spring onions and bean sprouts. 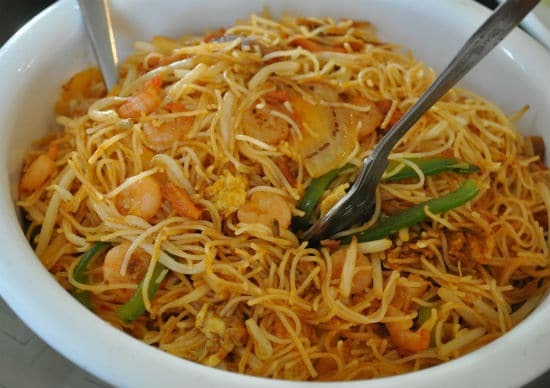 Feel free to comment or share your thoughts on this Singapore Fried Noodles Recipe from Awesome Cuisine.